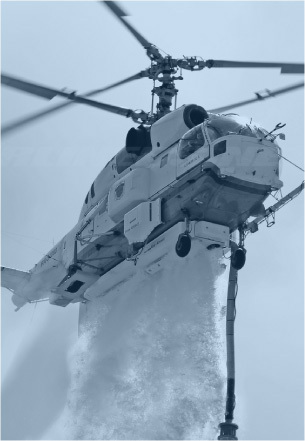 The diverse roles of the Ka-32A civil helicopter include passenger and cargo transport, a flying crane, transport for up to 5t in cargo, logging, search and rescue, medical and emergency evacuation, and offshore operations. The multipurpose Ka-32A11BC helicopter is powered by two TV3-117VMA turbo shaft engines and has a coaxial main rotor system. 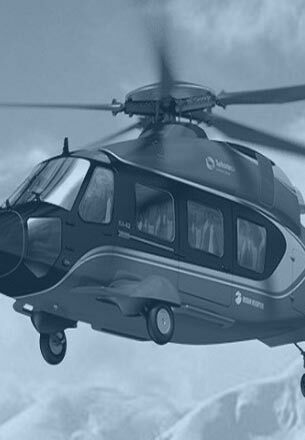 The helicopter in a standard configuration is certified by Transport Canada under Part 529 (equivalent to FAR-29) and 511.203 (a) and (b) of the Canadian Airworthiness Manual (Type Certificates Nos.H-100 dt 11.05.1998 for the Ka-32A11BC helicopter and & IE-35 dt 11.05.1998 for the TV3-117BMA ser.2 engine). The Ka-32A11BC has also achieved European certification of EASA. The Aviation Authorities of Mexico, Taiwan, Indonesia, South Korea, Japan, Brazil, Portugal, and Spain also certify the Ka-32A11BC helicopter. The helicopter can be operated in adverse weather conditions, by day and night, over land and water surface, including marine climate and icing conditions, at geographical latitudes to 75. It can fly both by visual and instrumental flight rules (VFR and IFR). As compared with the helicopters of a traditional single main rotor/tail rotor configuration, the Ка-32А11ВС helicopter has a number of advantages due to its coaxial configuration and specific layout. 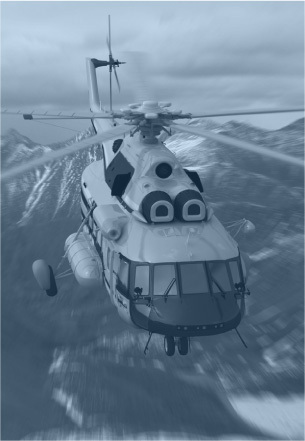 The lack of tail rotor ensures increased load lifting capacity, higher OGE hover ceiling and ability to fly at the altitude of 5000m (16393ft) due to higher efficiency of the helicopter coaxial configuration and lower (by 10÷15 %) power plant loss. Absence of interaction between individual helicopter control channels makes the piloting easier and simpler. Shorter tail boom and absence of a tail rotor make the helicopter very compact that, combined with its good piloting qualities, makes the helicopter very maneuverable and allows to operate the helicopter from off-shore platforms and landing sites of limited dimensions; the whole helicopter fuselage including its tail section is within the limits of the main rotors diameter. The helicopter can land and takeoffs from unprepared sites including sites overgrown with shrubs. Absence of tail rotor eliminates the personnel injuries when the helicopter is on the ground. Evacuation of casualties (patients) to the place of care, including the implementation of resuscitation on board the helicopter. Would like to discuss your purchasing interest with Avia Russia - or would like to learn more about repairs, renovations, modifications, upgrades or spare parts pertaining to this Russian Helicopter? © 2019 Avia Helicopters. All rights reserved.